Have you ever been told to take more risks? Usually risk brings out fear in us. We worry that if we take a risk, we’ll fail, other people will judge us, we’ll look stupid, or we’ll feel unsure of ourselves. And no one likes those outcomes. But the thing is, we can’t grow without taking risks. Our next level of success directly involves risk. #1. Increase difficulty. Push yourself to add additional challenges to what you already routinely do. #2. Differentiate. 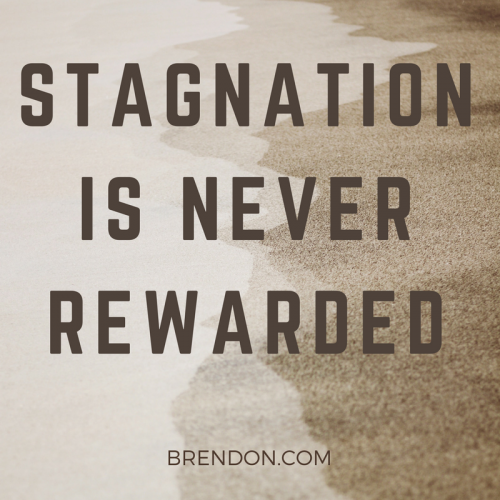 Stagnation is never rewarded. Now try a complete switch up. #3. Be more personal. Teach yourself to share more and be more vulnerable. The path of growth requires another level of personal authenticity and sharing. Listen or watch this full episode of THE BRENDON SHOW for the full training. Please hit the like button on this page! Pretty please? My blog, videos and podcast are ad-free ONLY because you share my work! Hey everybody, it’s Brendon. Have you ever heard that advice to take risks? But you felt like, “Well, I don’t want to take risk.” No one likes risk, right. No one wants to say when they wake up in the morning, “I’m going to take tons of risks today”. Usually, risk brings about fear. We’re worried that if we take a risk, We’ll fail, Other people will judge us, We’ll look stupid, We’ll feel uncertain or unsure of ourselves, And nobody likes those feelings or those outcomes. So, as much as people say take risks, it’s easy for us to say, “No, I’m not into that” but we also know intellectually that we can’t grow unless we take more risks, that your next level of success, that leap from this level to that level, there’s going to be risk there. You know, it’s from here to there and there’s that gap in between. You don’t know as you take that leap, if you’re going to do well. That’s the risk. You might fall. You might not do well. 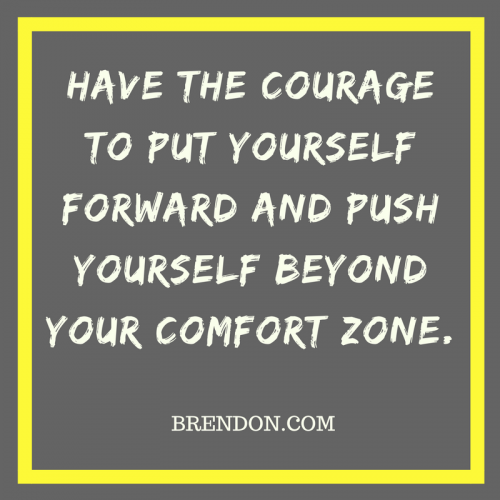 But if you’re not making those leaps and taking those steps, you’ll always be stuck where you were yesterday and to grow, we’ve got to have a lot of courage to jump in those risks. So, let me give you maybe a framework for how to think about taking risks. I always think about three ways to think about taking risks so that I’m continually pushing and growing myself. Because in the taking that risk to make it more difficult, I’ll grow. I’ll give you guys an example. Last weekend, I had the blessing to keynote a conference in New Orleans. Some of you all were there. It was at the Superdome in New Orleans which holds like a hundred thousand people but they kind of spiced it in half with a curtain and they had 20 – 30 thousand people in the audience. This was the Beach Body convention and it was a blast. So, I text two of my friends who happened to be in that organization. Tony Horton. Many of you guys know he is kind of the founder of and trainer for p90x and Chalene Johnson, who does piyo, and I text them both. I said, “What’s your hardest exercise move that people usually can’t get?” Because both those people are going to be at the conference and this was a lot of their super fans. Let’s go. So, Tony told me, he’s like, “The donkey kick is the hardest one.” The donkey kick is basically, you do a handstand, you kick your legs out, you land back plank position, you’re on your leg through like threading the needle in yoga and then you return and you do a burpee, okay. And Chalene said that the hardest move is the Piyo flip. So, I decided in front of 20,000 people to do those two moves back-to-back in a suit. So, imagine doing a handstand in a suit, kicking your legs out, threading the needle, then flipping over doing a full extended bridge. Not easy but I did it because it would be hard. Does that make sense? Part of the reason I got better as a speaker is because I was pushing myself. It’s very comforting and easy to give a big speech, and have a transcript and notes to read from. But I decided that, one day, I’m going to be able to get up on stage and give a speech with no notes whatsoever. Now, that’s hard, and that’s not comforting. 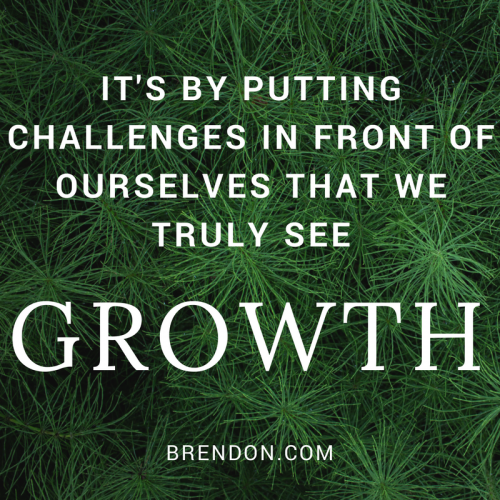 It’s not easy, but it’s by putting challenges in front of ourselves that we grow, and that’s part of taking risks. If the only challenges you’re dealing with in life right now are the ones that life dealt you, then you’re not living a fully conscious life yet. You’re living a life of reaction. 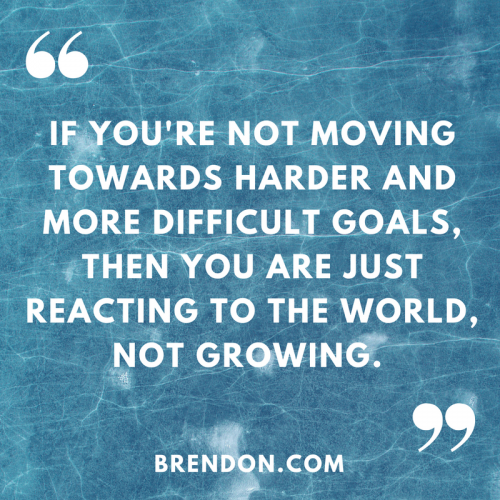 If you’re not moving towards harder and more difficult goals, if you’re not giving yourself challenges, if you’re not taking risks consciously, then you’re just reacting to the world, and you’re not growing. And so, challenge yourself. The next time you’re going to go do something, put yourself out there, try something new. How could you challenge yourself to make that process even harder so you get better? Obviously, you know, you need to that in the gym too, right? I mean, part of growing a muscle is stretching it and making it harder, making it difficult, pushing it beyond its current capabilities. That’s how you grow a muscle. Same thing. That’s how you grow in life. #2. Do something different. The second big thing I think about is, “How do I do what I’m doing and take a risk by being different? The first way to take a risk is to make your process harder so that you grow and stretch. The second way is to do something very different. I mean, maybe you’re already good at something, but now you’re going to completely switch up how you’re doing it. Right now, many of you know, I have a podcast. I’ve changed that podcast from something that’s been very successful (top 10 for over a 100 weeks in my category on iTunes). We completely changed it up. So, for those who listened to The Charge Life, we are now The Brendon Show and it’s completely different. It’s a new format. We don’t need to do it. The old way worked fine but part of taking risks is making yourself evolve, not being the late comer to evolution. And back then, nobody was doing videos in black and white on a weekly basis as part of it show. Certainly not in personal development. So, we did it. It was completely different. It was a risk for us. I mean, would it work going from color to black and white in the modern era? It did and some of those videos took off. We got millions of views. That happened because we decided to take a risk and be different. So, how can you be different In your category, In your career, In your field of interest? Whatever you’re doing, how can you purposefully choose to evolve and do something different? That’s a risk, and sure, not all risks are rewarded, but I’ll tell you what’s never rewarded: Stagnation. And then, the last one. Part of taking a risk is being more personal. Teaching yourself to share more, to be more vulnerable. It’s hard, I get it. You know, I’m in front of a camera, in front of a stage all of my life. Oh, I shouldn’t say it. My adult life. I mean, over the last ten years of my life, it’s been a very public journey for me. You see, if you’re on with us on Facebook, you know this is, we have five million fans on this Facebook page alone. Doesn’t count our other Facebook pages. You know what, we’ve just started and we’re going our Instagram channel. Hey guys on Instagram. I mean, this has been a journey for me of being in front of the public eye but even me for my next level, I’m going to have to share more about my personal life, be more thoughtful about that and that takes a lot of vulnerability. It doesn’t scare me, I just know I need to do it and I’ll give you an example. You know, when I first started my career in personal and professional development, you know because if you ask me, “Brendon, what do you do?” I would say well I’m a writer first and I’m a trainer second. I’ve been blessed to train more people on the topic motivation and high performance than anybody else in the world now. Our videos have been viewed over a 100-million times, over 10 million fans across our Facebook pages. I’ve been blessed to reach a lot of people but I can share with you, when I began my career, I thought I had to be Mr. buttoned up. You know, so proper. Because I came from the consulting world. You know, if you ever had a real job in organizational America and then, you start doing this, it’s hard not to be stiff and not share as much. I remember, the first time I ever shared with my audience back then, I shared with them about how when I started my career, I went broke. And I was in bankruptcy and I was struggling to start my career and do my own seminars. I had no idea what I was doing. It was new and it was scary and I’ll never forget though that after I shared that, so many people had come up to me and related to what I was talking about. I’ve been bankrupt or I came from poverty and I worked hard and I made it too and people would share their stories with me and it was really inspiring and taught me that people won’t believe your successes, if they don’t believe the struggle. People won’t believe your successes, if they don’t believe the struggle.You got to share where you struggled more in life and that feels like a risk. What you really desire in life? What you’re really going after? If they don’t know that about you, that’s not taking risks. Being quiet and avoiding difficult conversation is not taking risks and it’s not the path to growth. The path to growth for so many of us is another level of personal authenticity, another level of personal sharing and if you don’t do that, then you’re not taking risks. You’re just going through the motions. So, I would say that today, when you’re thinking about the next level of growth for yourself, think about risk. When you think about risk, think about it in these three ways I discussed. We can all go from being an average person to becoming an achiever, and we can all go from being an achiever to becoming a high performer, but it’s going to take some new habits for you to get there. I hope that this conversation about taking risks inspired you to think about just that.